Faye The Bride: A blessing or a curse, I’m a curvy girl and my derriere is my husband’s favourite feature so it seemed criminal to not to accentuate it. The Ascher dress by Maggie Sottero combined all of the elements I was looking for; delicate lace detail, a soft tulle fishtail, vintage glamour, structure inside the dress to lift, hold and support in all the right places as well as enough room to dance! 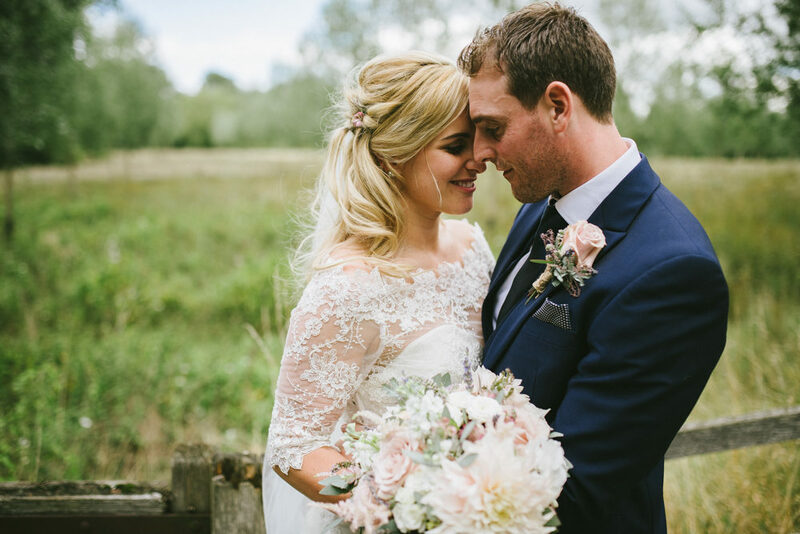 I loved the idea of a different look for day and night and settled on a beautiful lace bolero with stunning button detail down the back to create the look of being part of the dress for the ceremony which I could remove for the evening. 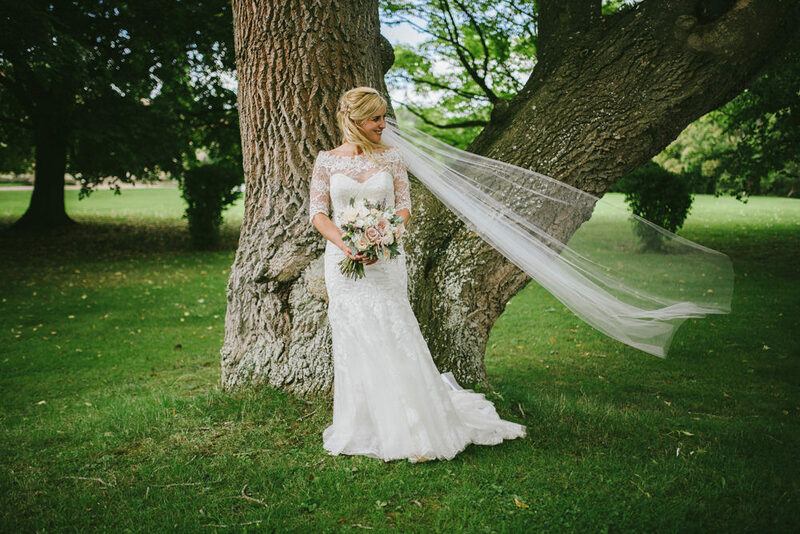 Adrienne of Adrienne Brides suggested a few alterations which bought the dress to life. We lowered the back of the dress, as well as reduced the sweetheart shape and added cups to lift the bust and make the dress a little more sassy (who doesn’t appreciate a little extra help?!). My earrings were by Jenny Packham and my shoes were Christian Louboutin’s. My very good friend Vicky McKay did a beautiful job on my makeup, friend and owner of Just Beauty did my lashes and my hairdresser Jade Towns travelled to Buckinghamshire to do my hair on the day. As far as groom’s go, Stu was very involved in the planning had a clear idea of the exact style he wanted to go for…his Pinterest board was bigger than mine! Suits, ties, colour pallets, shoes; you name it, he pinned it. We hired the suit from Anthony Formalwear, the ties were from Debenhams, his shoes were Russell & Bromley and he wore his Grandfathers pocket watch that his parents gave him on the morning of the wedding. He looked amazing. 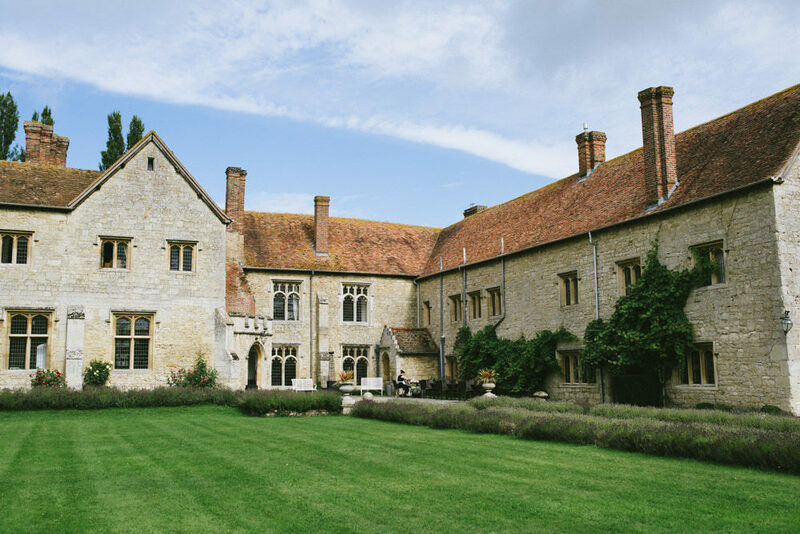 We’d originally been looking at weddings in France and discovered the Bijou chain of venue managers, which led us to Notley Abbey in Buckinghamshire. The beautiful building was once the family home of Laurence Olivier and Vivienne Leigh and there are stories of the infamous parties they held there, the history is just incredible. Notley was the first wedding venue we ever saw and knew from the moment we drove along the lime tree lined driveway (planted by Vivienne herself) that it was the one. The Monks Refectory where the wedding breakfast was held had 4 stunning chandeliers hanging on the beams and the most amazing architecture on the main walls. The stunning mix of old and new matched our style perfectly as well as having many rooms to create a wonderful flow to the day. We blew the budget on the venue and it was worth every single penny. I’m a huge fan of flowers and wanted them to take centre stage so we kept all other decoration to a minimum. We wanted to accentuate the relaxed, country glamour of the venue to create a soft, rustic feel so decided on a blush colour scheme with a touch of brushed silver on the tables and rose gold on the stationery. I was a little unsure of how it would all come together but it worked really well. 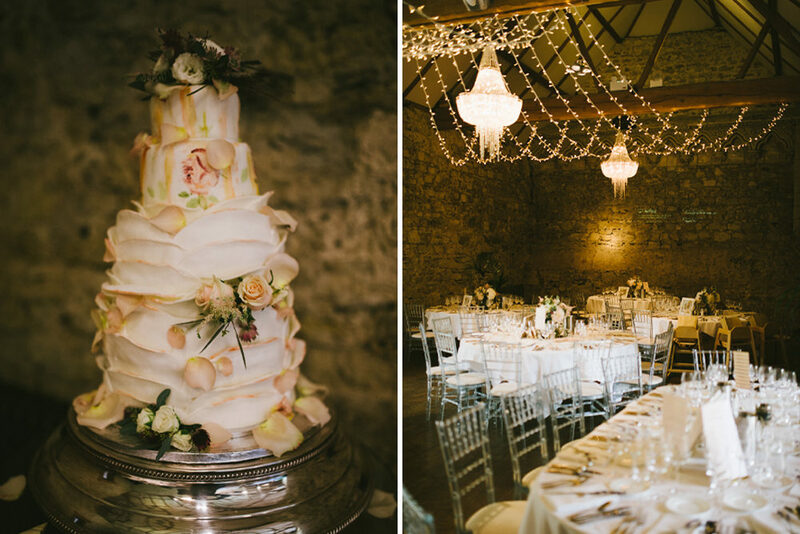 Our biggest decorative expense (flowers aside) was the most beautiful fairy light canopy (courtesy of Oakwood events) draped over the beams in the Monks Refectory. We used the theme of travel for our tables as we’re both globe trotters. I made the ‘map of the world’ table plan myself using a mirror frame from home and craft supplies bought online. The table name displays were made from frames borrowed from a friend and customised by my best friends uber-crafty mum Brenda. They looked brilliant! Jodie Sutch of The Little Violet was like my floral fairy godmother and made all of my petal-based wishes come true! I lost sleep over the flowers as I had such a clear idea of what I wanted and couldn’t be sure that she had interpreted my vision…. how wrong I was! 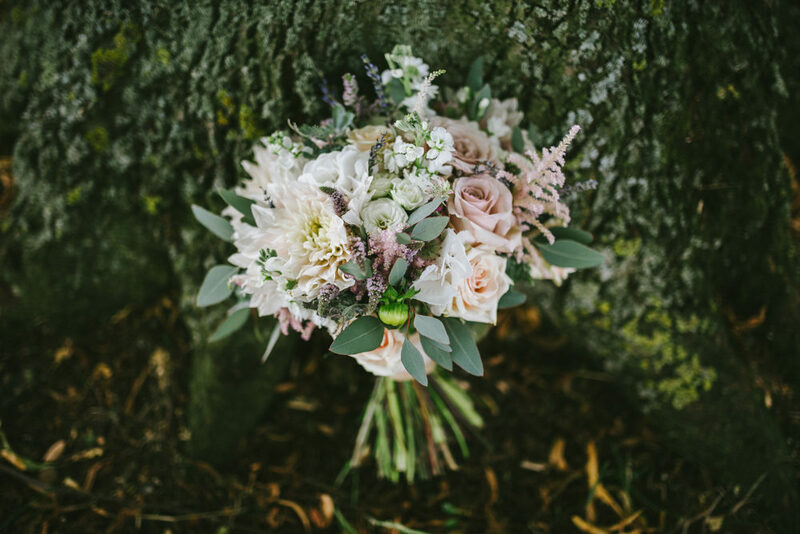 She captured the brief perfectly incorporating blush Dahlia’s, white Hydrangeas, roses, lavender, astilbe and stocks with a wonderful ‘gathered’ feel so it didn’t look too arranged. She also gave recommendations of things to add to maximise the impact whilst accommodating my ever-growing requests within the budget. 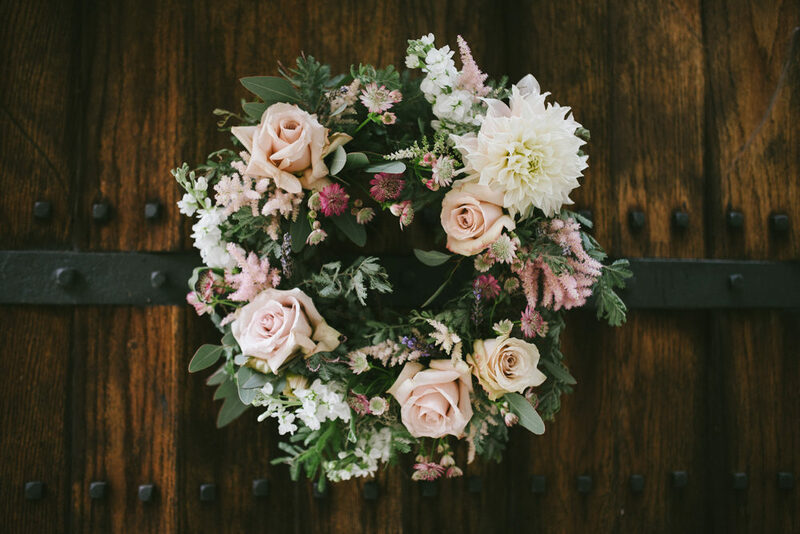 The bud vases along the aisle, floral wreath for the door, flowers for my hair and little floral crowns for the flower girls were last minute additions that I am delighted with. 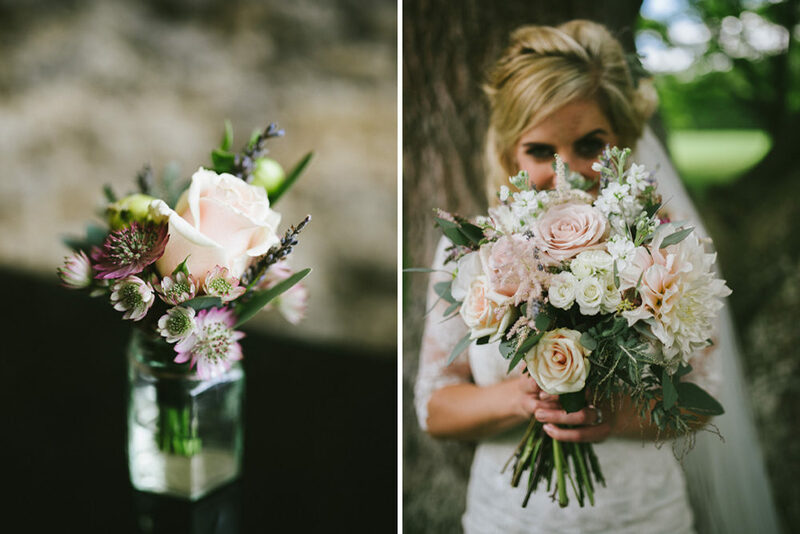 I loved every single aspect of the flowers and could not recommend her enough. I took a risk on the bridesmaid dress and ordered them from a website in china called For Her and For Him. The fabric and style of each dress was lovely and although I had a few challenges with sizing, they allowed plenty of material in the seams for adjustments and looked fabulous on the day. The groomsmen’s suits were hired from Anthony Formalwear and the flower girls dresses were from BHS. 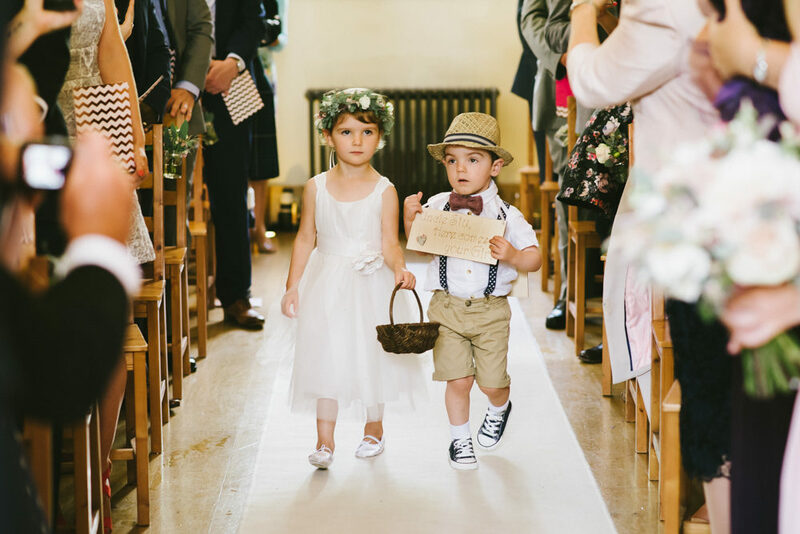 Our pageboy wore an M&S shirt and shorts with a pair of Converse and braces and a bow tie from Etsy. The hat was the models own. We had a band called Hipster, booked through Alive Network and They. Were. Awesome. We had a special request for our first dance song, an acoustic version of Rhianna’s Hopeless Place, which they played perfectly and from the minute they started playing to the minute they stopped, the dance floor was packed! 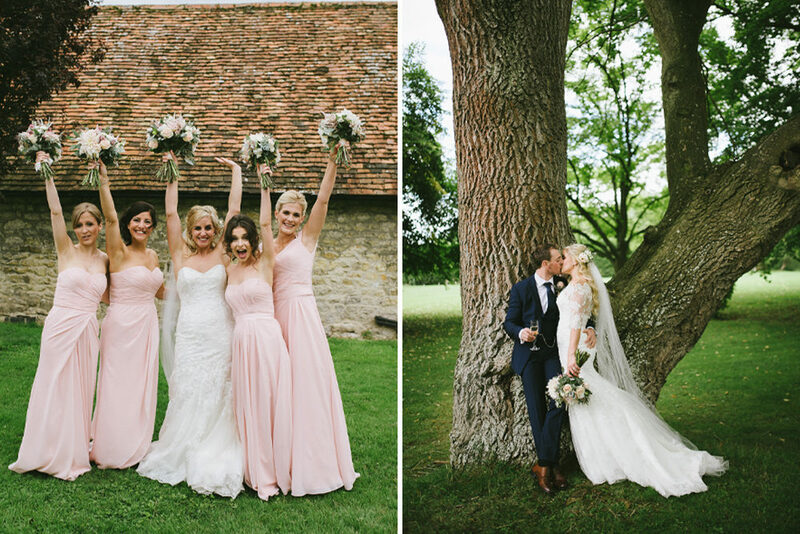 Ed is wonderfully talented wedding photographer and we fell in love with his work as soon as we saw it. He has such a unique style with so much depth to every picture, as a photography fan, it was the stuff dreams are made of. 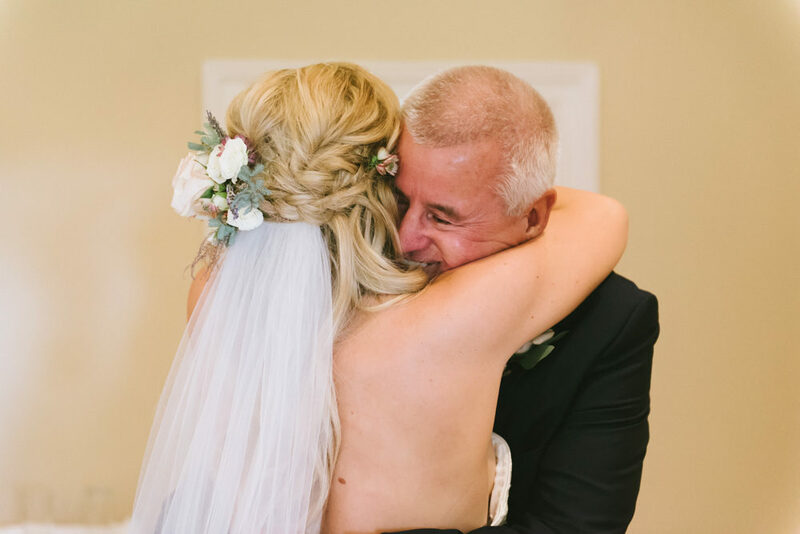 Ed has a magical ability to capture the story of the day through his photographs and we couldn’t have been more pleased with the tale he has told with his images. He was a dream to work with on the day and we will cherish his images forever. Ladies if you have not yet discovered K and K Weddings then you’re in for a treat. Harry and George have worked in the videopraphy industry for years which really reflects in their work. Their style is beautiful and the resulting video is like a Hollywood movie of our special day. I cannot recommend them enough.